Total gain of 69.74% on CMP Market Trend trades using SPXL/SPXS since Dec 12, 2018. Total gain of 260.64% on SPY options trades (put and calls) since January 3, 2019. Total gain of 76.87% of individual stock option trades since January 25, 2019. After getting killed in December 2018 on too many individual stock option trades, I decided to take my foot off the pedal at the start of 2019 and ease up on the number of trades - go after quality rather than quantity. I'm glad to report that my Q1 2019 numbers are very good - I made money on all three of my trading strategies: trading the S&P 500 via SPXL/SPXS, trading the S&P 500 via SPY call and put options, and trading individual stocks via call and put options. I admit that I've been light on the individual stock option trades so far this year, but now that I have my trading feet back beneath me, the number of options trades on stocks will start to ramp up in Q2 2019. Below is a summary of all my Q1 2019 trades for your review. On December 12, 2018, I started using a new trade set-up to trade the S&P 500 both to the upside and to the downside - so far the results have been fantastic. The trade model uses the NYSE Bullish Percentage Index to identify entry points for long and short trades on the S&P 500. I then use the Direxion Daily S&P 500 Bull and Bear ETFs (SPXL and SPXS) which provide 3x leverage on the trades. This is a swing trading model, so I'm always either long or short the S&P 500. I allocate 30% of my portfolio to these trades. Since December 12, 2018, the trades have generated a total return of 69.74% (up to April 12, 2019). In comparison, the S&P 500 is up 9.65% over the same time period. As of January 3, 2019, I've posted a total gain of 260.64% on my call and put options trades on the S&P 500. 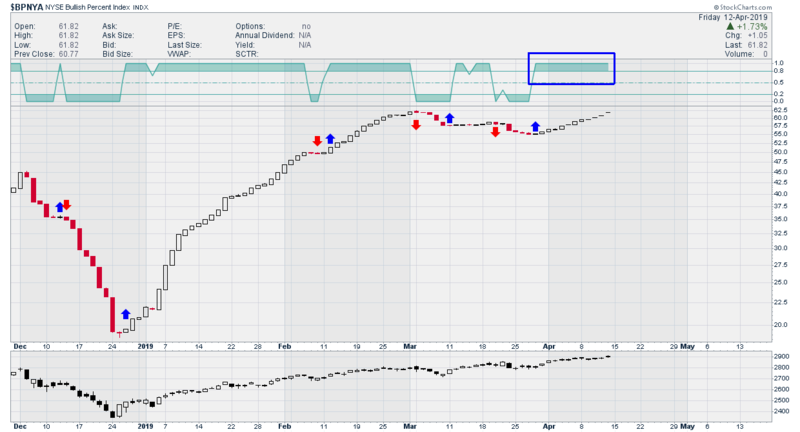 As of February 7, 2019, I started to buy SPY call and put options based on the trade signals generated by my CMP Market Trend Indicator. I usually buy SPY options that are around four weeks to expiry for these trades, and the average leverage per trade has been approximately 25x for eight trades executed in 2019. I have to admit that I was a bit traumatised by getting caught on the wrong side of too many stock option trades in December 2018. It has taken me a while to gain back my confidence. I went back to the drawing board to review and test my trading model to make sure that the December mistakes don't happen again. As a result of this pause and review, I only executed seven stock option trades in Q1 2019 - six winning trades and one losing trade (quality over quantity). The total return on the trades was decent, but I know that I have to increase the number of trades going forward (ideally, I want to execute at least three stock options trades per week). Long trade on 01 Feb 2019 (VIX 15MAR19 35 calls) which generated a loss of 100% (expired at zero). Long trade on 03 Apr 2019 (VIX 17MAY19 27 calls) which generated a loss of 10.75%. I will keep trying to get on the right side of the VIX movements. It feels good to get a solid quarter of trading under my belt. My CMP Market Trend Indicator has allowed me to trade the S&P 500 with confidence. Now I just need to start executing successfully on individual stock options trades. To view the option details (strike price, expiry date, and leverage), you can sign up for a Free Trial for The Options Trader. Only Members receive real-time trade alerts. Disclosure: I am/we are long SPY. I wrote this article myself, and it expresses my own opinions. I am not receiving compensation for it (other than from Seeking Alpha). I have no business relationship with any company whose stock is mentioned in this article.